Video doesn’t just belong on YouTube. 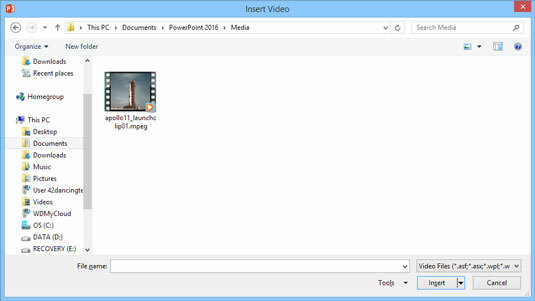 You can easily add video clips to your PowerPoint 2016 presentations and play them at will. Adding a movie motion clip to a slide is similar to adding a sound clip. A crucial difference exists, however, between motion clips and sound bites: Video is meant to be seen (and sometimes heard). An inserted motion clip should be given ample space on your slide. 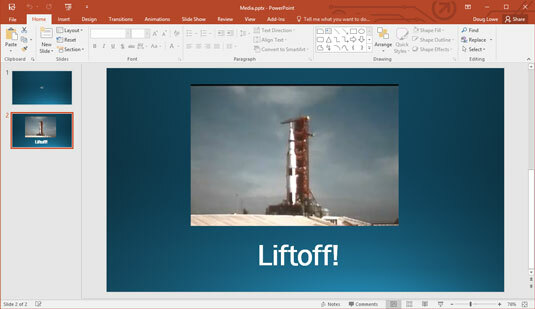 The hardest part about using video in a PowerPoint presentation is finding a video file that’s worth showing. Use Google or any other search service to find a video to insert. Then, download the video to your computer. Or, you can create your own videos using a camcorder and video-editing software. You may need to scroll the list to find the movie you’re looking for or navigate your way to a different folder. You can also insert a video directly from an online source by choosing Online Video rather than Video on My PC in Step 3. Then, you can search for a video online. Note that this option inserts a link to the online video, not the video itself. That means that you must have a working network connection to play the video, and if the owner of the video removes the video, the link won’t work.